This is in continuation of our earlier mails for deputation of 03 teachers through CCRT’s DRPs from your district in the workshops to be organized during the months of December, 2018. The CCRT will be organizing 4 Workshops for in-service teachers in the months of December, 2018, which all are confirmed. 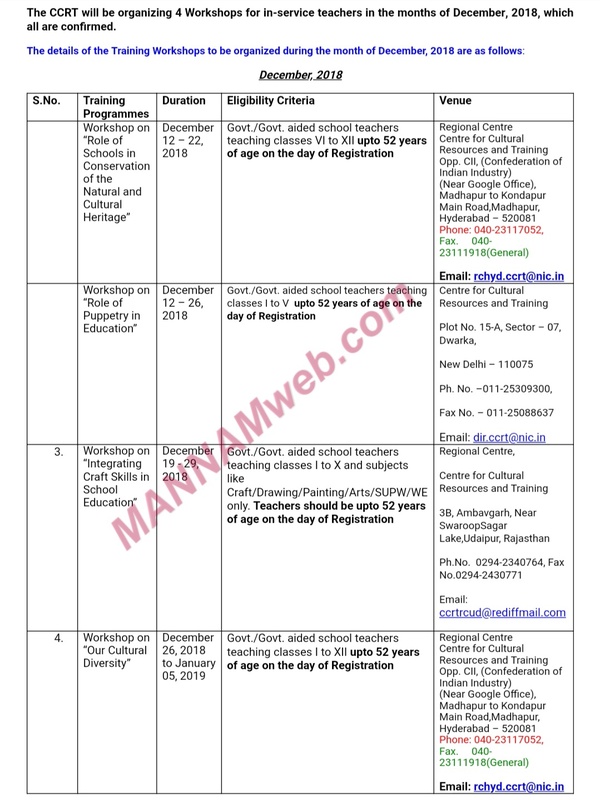 A copy of Tailor made Selection Letters for free distribution among deputed teachers, related to the above mentioned Workshops are attached herewith. The concerned CCRT DRPs of your district will coordinate with your kind office for deputation of teachers in the training programmes. Looking forward to receiving your support in this regard. r participants of CCRT Training Programmes are entitled to travel by AC 3-tier/ ACChair Car/ Sleeper class of all the trains, as the case may be, from their nearest railway stationhead to the venue of the programme, by the shortest route. Submission of the Xerox of the ticketis mandatory. .4. For local road journey from the nearest Railway Station/ Bus Stand to the venue of the trainingprogramme, the teachers will be paid Auto/ Bus fare as per CCRT rule.Please note that the Rail/Bus fare will be reimbursed by the CCRT if original/ photocopies of thetickets are attached to the T.A. Bills for inward as well as outward journey failing which the claimwill be restricted to rail fare by sleeper class. There is no provision for Air Fare/Tatkal/Flexi Fareand even if the teacher travel by any of these mode, their claim will be restricted to rail fare asper their entitlement i.e. AC-3tier/AC Chair Car/Sleeper Class as the case may be onproduction of original/photocopies of the journey tickets.No break in journey is permissible as per rules. Teachers are requested to buy direct journey ticketfrom their nearest Railway Station to the venue of the programme.The teacher participants from Andaman & Nicobar Group of Islands and Lakshadweep Group ofIslands are entitled to travel between the mainland and their respective institution by ‘Bunk Class’ ofships operated by the Shipping Corporation of India Limited/MVSwarajdweep/Nancowry/Nicobar/Campbell Bay/MV Harshavardhana. However, for travel by MVAkbar, they are entitled to travel by AC Dormitory also in addition to Bunk Class.For the to & fro journey from the mainland to the venue of the training programmes, their travellingallowance entitlements will be governed by the same CCRT norms as per details given above.The teacher participants will be paid Allowances for attending the training programmes as per theCCRT’s norms.The CCRT will be providing free lodging and boarding facilities mandatorily to all the participants.  All allowances will be transferred to the authorized bank account through RTGS/NEFT/ECS, asper details provided by the participants, on successful completion of the training programme,hence correct account details should be provided to the CCRT. The teacher participants areexpected to fill up the correct account details in the prescribed format and must enclose a copy ofcancelled cheque leaf also.